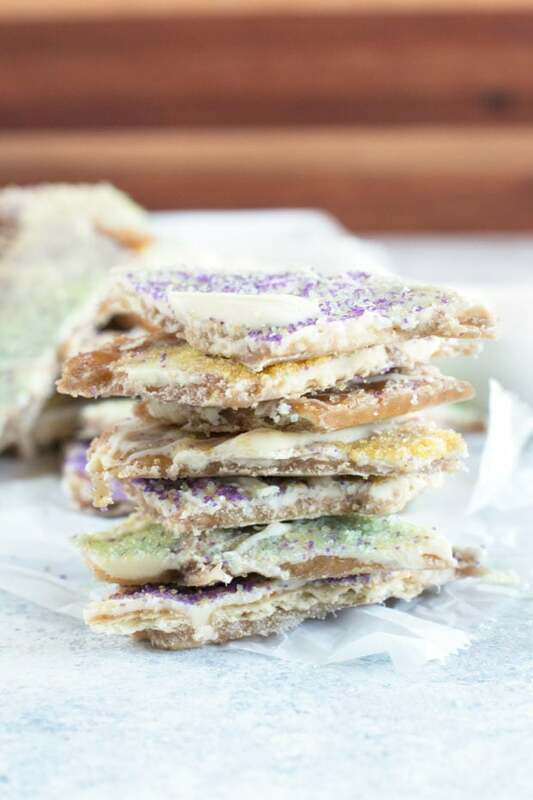 Mardi Gras season is here and that means it’s time to break out the King Cake Crack Candy! 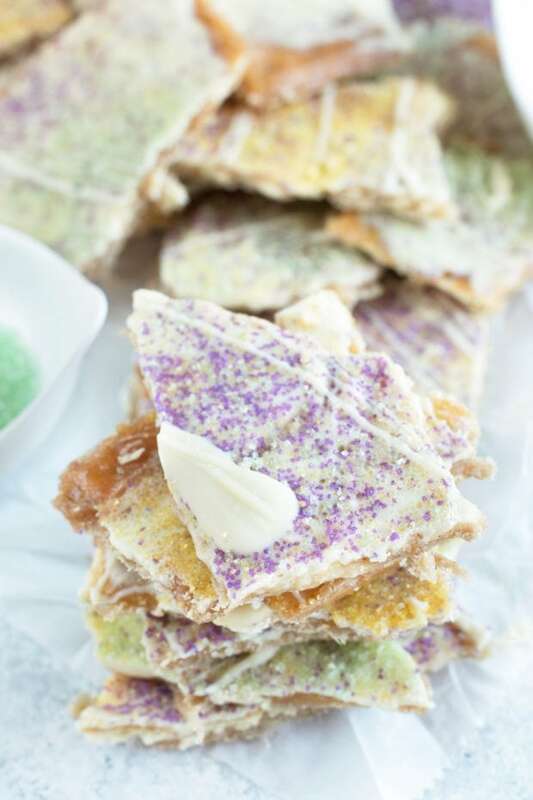 With all the colors and flavors of a King Cake, this “crack” candy is the sweet treat everyone will be reaching for. You won’t believe how ridiculously easy it is to make! Mardi Gras season is in full swing and even though I am heading to the other side of the planet, I am keeping the fun near and dear to my heart. Ok really, more like my stomach. But that’s the way to my heart. So it all makes sense? 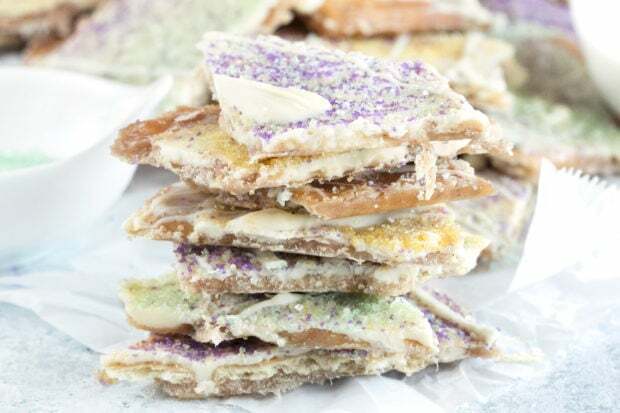 ANYWAY, I have always loved the idea of King Cake for Mardi Gras, but with January being the crazy month it generally is, and February centering around pink heart mania, I tend to kinda miss the holiday out here in Colorado. So since baking a cake isn’t the highest of my priorities, I opted to make that King Cake dream of mine come to life, but in a much simpler and easier way. “Crack” candy is traditionally made around Christmas, but honestly, I think it can be busted out for any holiday. This particular recipe is a great example of that. Which I wouldn’t blame you for AT ALL. Honestly, this candy never lasts long. Piece by piece the deliciousness disappears…. How can you resist it though? There’s white chocolate. Then there’s cinnamon. There’s a crunch and a little bit of saltiness to counteract the sweetness. It’s everything you could ever want, in the easiest to make recipe ever! 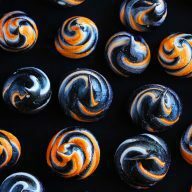 So whip up a giant batch for your celebrations! It’s a great snack and dessert for anytime of day. 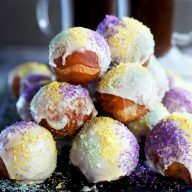 PLUS consider making my Hatch Green Chile Gumbo, Beignet and Coffee Cocktail Shake, and/or Cajun Shrimp & Andouille Sausage Stuffed Potatoes to round out the festivities! 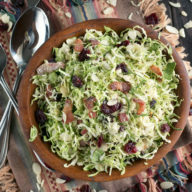 I love using my Nordic Ware Natural Aluminum Commercial Baker’s Half Sheet for this recipe! It’s just the right size. 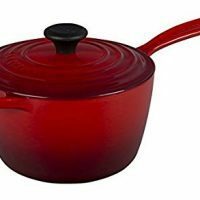 If you don’t have a great saucepan, you can always rely on the Le Creuset Signature Cast Iron Sauce Pan! Mine is in red – DUH. is ideal for stirring AND scraping out every bit of magic in this recipe. Pin this King Cake Crack Candy recipe for later! 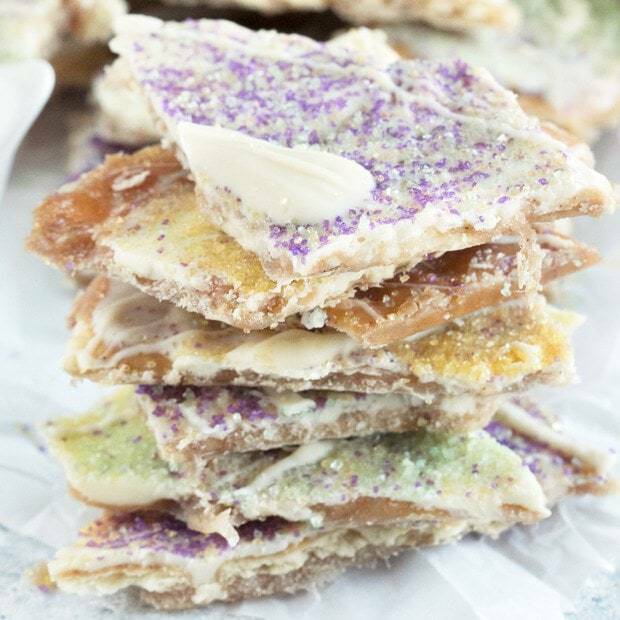 Celebrate the Mardi Gras season with this festive and EASY candy. 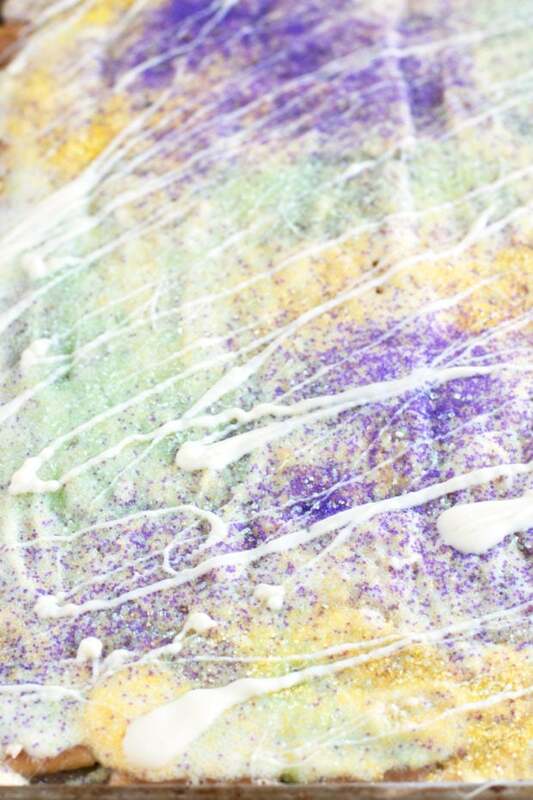 All the flavors of a King Cake, but without all the work. PLUS white chocolate. 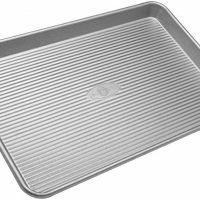 Preheat oven to 375 degrees F. Line a rimmed cookie sheet with parchment paper. Lightly spray the parchment paper with cooking spray. Place saltine crackers side by side on the parchment paper. Set aside. Combine butter, brown sugar, and cinnamon in a large saucepan. Bring to a boil over medium-high heat. Boil for 3 minutes, stirring constantly. Remove from heat and stir in vanilla. Pour the mixture evenly over the crackers. Use a greased spatula to spread over the crackers as needed. Remove from oven. Top with 12 oz white chocolate chips. Let rest 5 minutes. Use a spoon to spread the melted white chocolate evenly over the crackers. 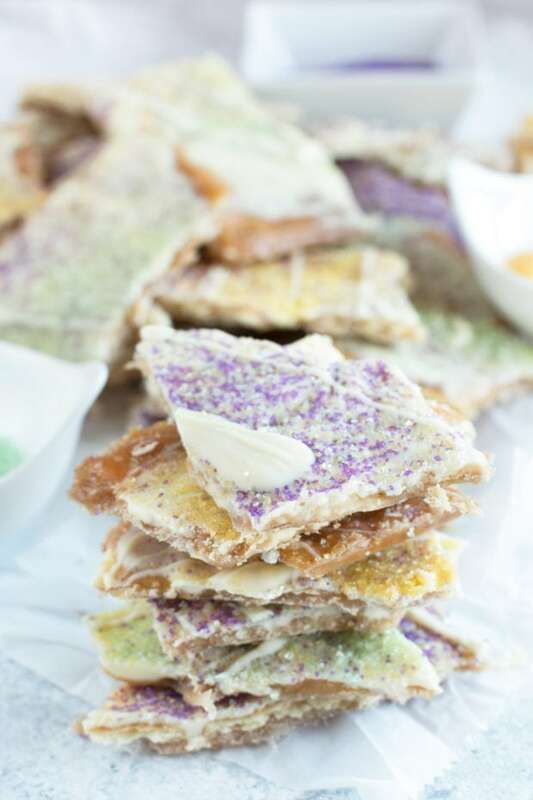 Decorate the top with green, yellow and purple decorative sugars. Drizzle with additional white chocolate as desired. Cool in the freezer for 30 minutes. Break into pieces. Store in the refrigerator in a ziplock bag or airtight container. I get my decorative colored sugars at any local Michael's, Hobby Lobby, or craft shop that carries cake decorating supplies. The recipe doesn’t mention where to use the cinnamon. I assume it gets added to the brown sugar-butter mixture? Oh gosh, sorry about that typo! Yes, it gets added to the brown sugar and butter mixture. I am updating the recipe now! Thank you! I added the vanilla into the sugar mixture since the directions doesn’t say where to put it I assumed it was in the mix lol… just made this and about to try it in 30 mins! Thanks for sharing! Where can I buy colored sugar or do I have to color the sugar? I get mine at Michael’s or Hobby Lobby! You can also order them on Amazon, but I always find them at either of those stores in the cake decor area. Looking forward to bringing some Mardi Gras to my Mississippi friends. Thanks for sharing. I made this tonight, I sprayed cooking spray on my wax paper and when I took it out the freezer it was stuck to the bottom and when I tried to peel it off the “crack” it would not come off. HELP! Hi there! Sorry to hear you are having trouble! Try letting it come to room temperature a little bit more, it should peel off then. Holy cow, just made these for book club and I am going to have a hard time waiting until everyone gets here! 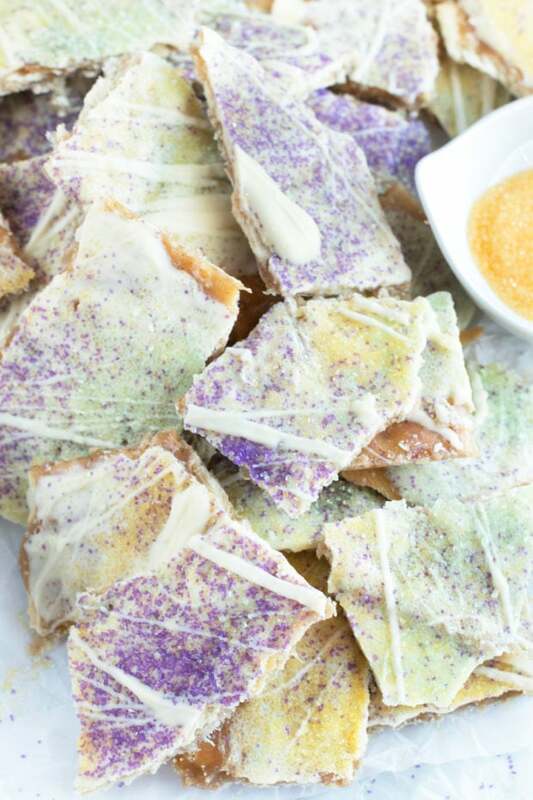 These are so delicious and really taste like king cake! I am going to be making a blog post on these and will link back to you. I assume I should melt the chips before topping the crackers? Does it matter on the brown sugar – light or dark? You can use either! If you like a more molasses flavor use dark. I usually use light! I made a batch of this yesterday to take to my Bible Study class. To say it was well received would be an understatement; they loved it, and so did I. It’s a nice variation of the traditional toffee and chocolate recipe, and it’s easy to make. YAY I love to hear that! I’m so glad you enjoyed it!